But I’m going to bend over backwards to be fair. I’m not going to condemn the economists back in the 1920s and 1930s who were sympathetic to central planning. They were horribly wrong, but that was before economists from the Austrian School prevailed in the “Socialist Calculation Debate.” So we’ll give them an undeserved pass. And we’ll even excuse the wrongheaded thinking of economists who sympathized with communism in the first couple of decades after World War II. After all, maybe they were just naive when they blindly accepted and regurgitated statistics from the Soviet Union (just as I think some people today are being somewhat gullible when they accept stats today from Beijing). But there’s no excuse for any sentient being – especially an economist – to have praised the decrepit communist economic model by the time we got to the 1980s. Especially since he made that claim shortly before the Berlin Wall collapsed. That takes a special type of ignorance. But Samuelson wasn’t the only academic economist to disseminate nonsense. Alex Tabarrok of Marginal Revolution shares some additional examples of mal-education. …an even more off-course analysis can also be found in another mega-selling textbook, McConnell’s Economics (still a huge seller today). Like Samuelson, McConnell estimated Soviet GNP as half that of the United States in 1963 but he showed that the Soviets were investing a much larger share of GNP and thus growing at rates “two to three times” higher than the U.S. Indeed, through at least ten (!) editions, the Soviets continued to grow faster than the U.S. and yet in McConnell’s 1990 edition Soviet GNP was still half that of the United States! Professor Tabarrok speculates on why some economists were so wrong. To be sure, the production possibilities frontier is a useful analytical tool for economists. But these economists erred in assuming that central planners could allocate resources efficiently. More specifically, they looked at high levels of supposed investment in communist nations and assumed that would mean faster rates of growth. That theory is correct, but only if capital is being allocated by the private sector in a system governed by market prices. Government investment, by contrast, is a recipe for pork, inefficiency, corruption, and waste. If we were constructing an Economist Hall of Shame, we’d also want to include Lester Thurow, who was basically the Paul Krugman of the 1980s. As recounted in this Hoover Institution interview, he also pimped for the Soviet Union right up until the point it collapsed. ZINSMEISTER But why have persons proven to have been calamitously mistaken been allowed to wriggle away? For instance, here’s a quote from Lester Thurow—dean of MIT’s business school, for heaven’s sake—writing in 1989: “Can economic command significantly accelerate the growth process? The remarkable performance of the Soviet Union suggests it can. Today it is a country whose economic achievements bear comparison with those of the United States.” Why isn’t this fellow laughed out of court? CONQUEST These people were had for suckers. They believed figures and images and statements about the Soviet Union that did not accord with reality. This was also enforced in the Soviet Union. You had to believe the place was happy, well fed, and so forth. …there were two different Soviet Unions, the real one and the one put forward in the West. Often the unreal one was backed by huge amounts of impressive, phony statistics. It takes two to sell the Brooklyn Bridge; you need both a crook and a sucker. The apologists in this country swallowed the rubbish about communism because they didn’t like the people putting forth the opposite view. Let’s close with an amazing – and depressing – observation. An article by Professor Bryan Caplan for the Foundation for Economic Education looks at Princeton Review‘s AP Economics and notes that there are still some economists suffering from moral blindness. When I was first learning economics, I was surprised by how pro-communist many economics textbooks were. …textbooks were very positive relative to communism’s historical record. 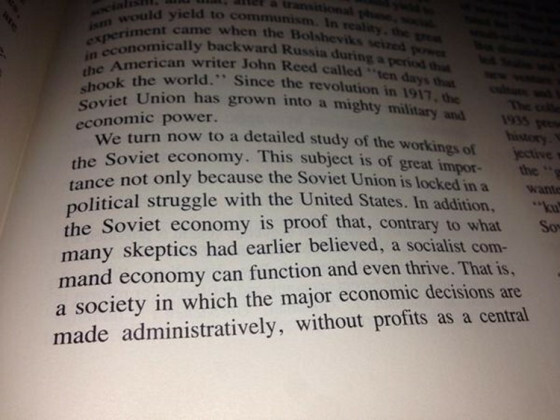 …Many textbook authors were, in a phrase, communist dupes. Sadly, some communist dupes still exist and they work at Princeton Review. Caplan highlights this excerpt from the book. Bryan then explains why AP Economics is nonsense. The official communist line was that collective ownership would lead to high economic growth – and ultimately cornucopia. And in practice, communist regimes made collective ownership an end in itself. Just look at their repeated farm collectivizations that caused horrifying famines in the short-run, and low agricultural productivity in the long-run. …Communist regimes began with the mass murder of their political enemies, businessmen, and their families. Next, they seized the peasants’ land, leading to hellish famines. …And no communist regime has ever tried to “divide wealth for equal advantage.” Bloodbaths aside, communist regimes always put Party members’ comfort above the very lives of ordinary citizens. Good people rejected communism from its inception because it was based on the immoral notion that individuals should be subjugated to the state (the same ideology in fascism and other collectivist movements). As I noted above, I’m willing to forgive others (at least in the early decades) for thinking that communism might be economically successful. But I have nothing but scorn for those who were pimping for totalitarianism in the 1980s (or still today). Economists already are the subject of derision and it’s easy to understand why after seeing how some of them excused an evil system.